Lots of people ask me how to make money one line. Setting up killer landing pages that convert traffic to sales is one of the oldest ways known in affiliate marketing. Why Landing page templates? Making the most of your traffic is critical to success. If you have a great landing page converts your traffic to sales you will be able to take time and spend money to get traffic. You will also be able to get affiliates to drive traffic to your sites because there traffic will convert to sales. Free landing page templates enable you to gain from someone else’s experiences in converting traffic to make sales from killer landing pages. Just very helpful how you explained how to improve a landing page, will follow your tips. 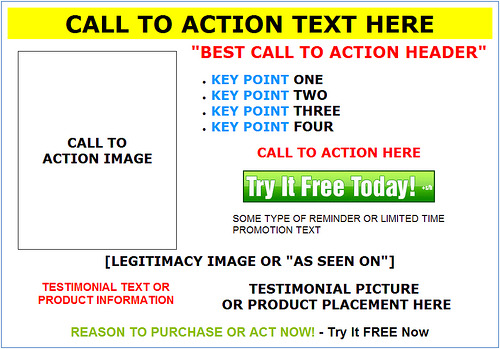 The more eye catching the texts are, the more chance a visiter will buy.